Despite only being formed in 1995, Donald Steel's layout at the Gower has already matured into one of the best courses in the south of Wales. 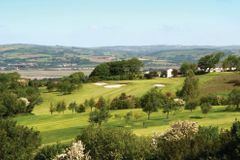 The course is set on the Gower peninsula, and as such, it allows for tremendous views across the Loughor Estuary and the surrounding coastline. The greens have been built according to USGA specifications, and as a result they roll true throughout the year. The hazards that now face visiting golfers have been developed from the natural landscape, testament to Steel's ability to use the existing conditions to his advantage. The clubhouse was formerly a farmhouse, but with some amendments it now serves to welcome golfers from far and wide. The traditional farmhouse building has been converted superbly to offer comfortable accommodation for those who choose a golf break at the Gower. The 11 en-suite bedrooms are decorated warmly, with all the necessary features to ensure that guests are well cared for. Within easy travelling distance of Swansea's town centre, the Gower is easily accessible, and is testament to the excellent golf breaks that can be experienced in South Wales.